Maybe if JFK hadn’t kept his cool in those crucial thirteen days at the height of the Cold War and a nuclear holocaust had eventuated, this is the sort of post apocalyptic motorcycle the Russian police just might be riding today. 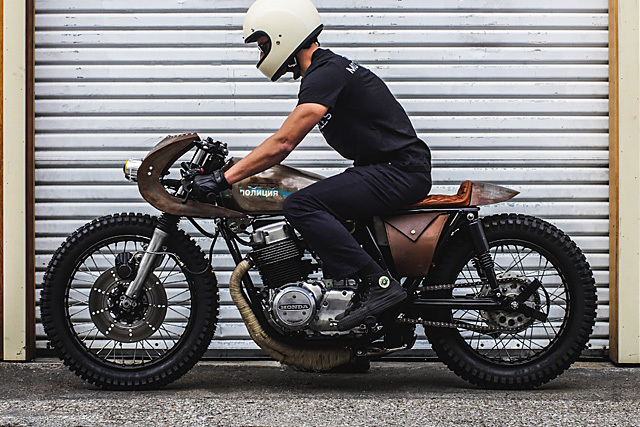 Thankfully that scenario never did eventuate, but when a new client approached Los Angeles-based builders Thirteen and Company he had just such a bike in mind. The brief was for an end of the world Mad Max style and the team were happy to deliver. 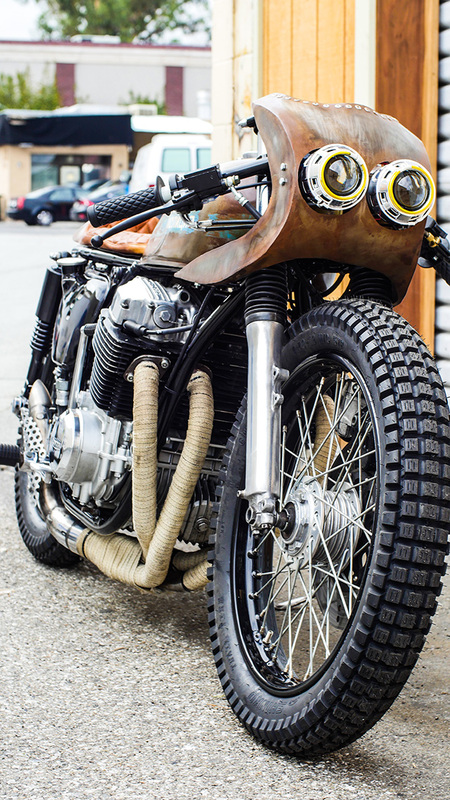 It’s not the type of bike the guys normally build but this 1972 Honda CB750 known as “The Russian” is proof their talent is not limited to just one style. 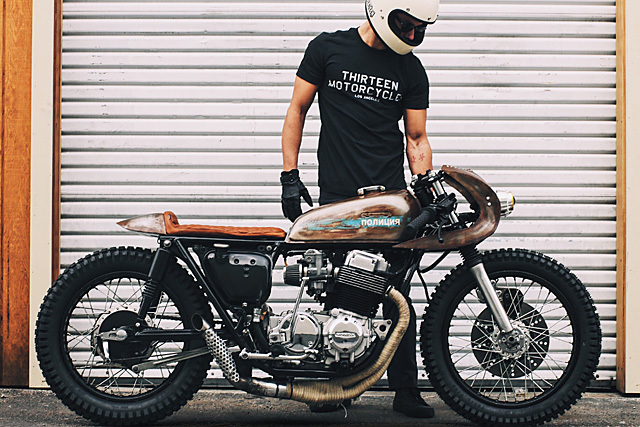 Thirteen and Company is the brainchild of 23-year-old accomplished racer Kyle Vara who has been tinkering with bikes since he was old enough to crawl. But it was when tragedy struck, breaking his leg and shoulder, just a week out from his first professional race at the Anaheim Stadium in the AMA Supercross Lites Class that his life as a professional bike builder really began. 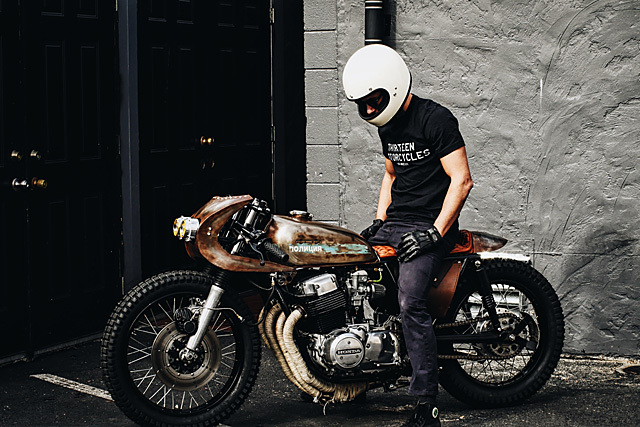 With 8 months to sit around and heal and the boredom kicking in to overdrive the idea to turn his skills of prepping his bikes to go racing into a business of customising old motorcycles was born. The first bike to get the Thirteen and Company treatment was an old SL125 Honda he had lying around, but it was this build that confirmed to Kyle he was on the right path. 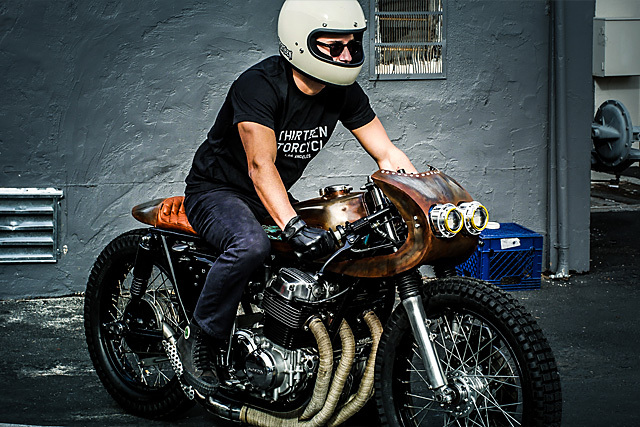 With a growing portfolio of builds circling the internet a Police Officer from San Jose came to him with the idea for this machine and the start of “The Russian” project was born. The stock tank was de-badged and the little imperfections left behind to truly embrace the overall look they were trying to achieve. It was hand painted before being treated to a chemical patina, also used on the front fairing, that instantly gives the look of a 100 year hard life. With the client wanting the bike to have a tip of the cap to his profession as a law enforcement officer they couldn’t exactly place a “Police” logo down the side, it’s illegal. 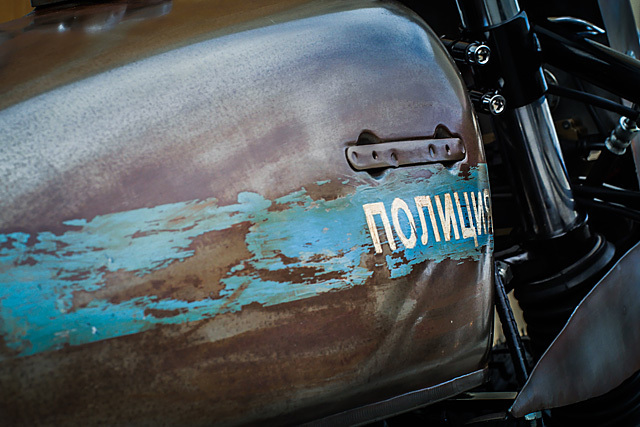 So the idea came to write it in a foreign language and with the cool stylings of Russian typography and it matching the theme of the bike so well it was the perfect choice. Finishing out the tins is the hand formed seat made from 16 gauge sheet that was tirelessly rolled through the English wheel until just the right shape was achieved. 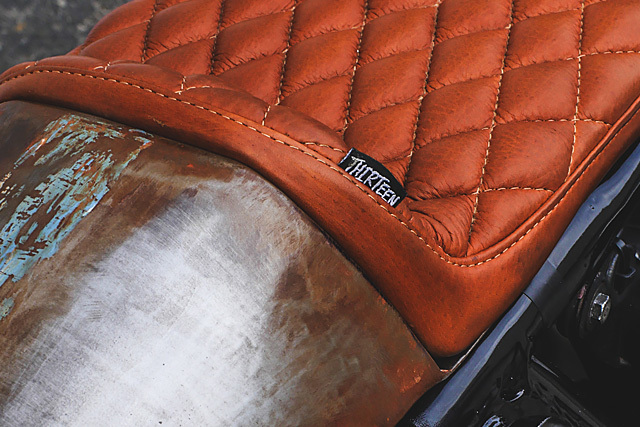 The metal work was finished in the same chemical patina with the cushioning coming from genuine American Buffalo leather stitched in Thirteen and Company’s signature 1 inch diamond pattern. 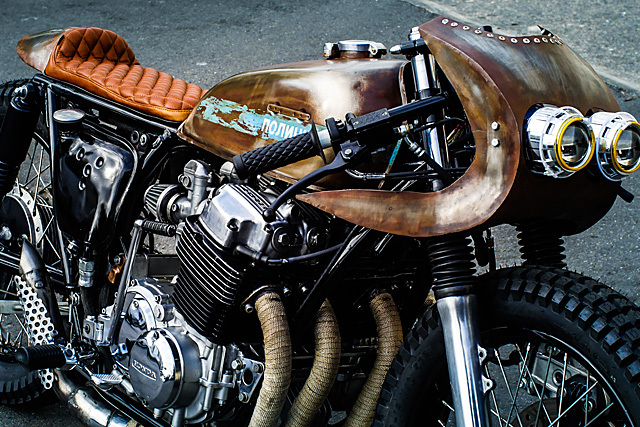 Powering the Honda is of course the legendary CB750 engine which in 1972 was 736cc in capacity and of SOHC design. The air-cooled lump was good for 67bhp from the factory but was one of the earliest engines that allowed for breathing modifications without needing to crack the block or head open. Taking advantage of that Kyle has fitted a neat 4-into-1 heat wrapped exhaust that replaces the bulky factory design. The four heavy chrome mufflers have also been shown the door with a single rorty tip finishing out the system with a very industrial drilled metal shield. The airbox is gone and the bank of four 28 mm Keihin carbs now breathe through individual pod filters. 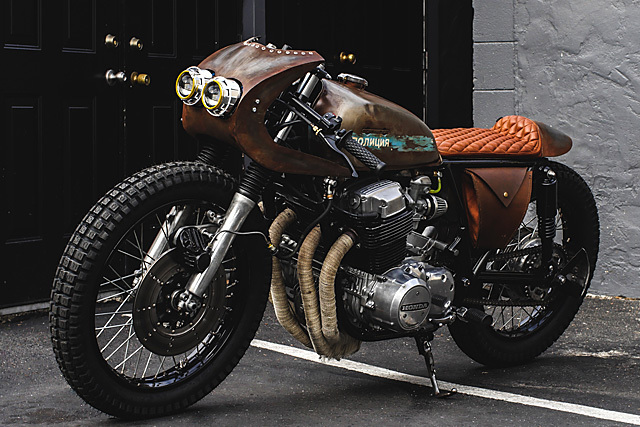 The mix of heavily polished covers and blacked out barrels and oil tank show off the classic Honda engine without being over the top and conflicting with the overall look. With so much work having gone into creating this tough and aggressive post-apocalyptic design the stance had to be changed to suit. The gator’d front forks have been relieved of three inches of travel to get the Honda low to the ground and new rear shocks in matte black bring the rear down the same amount. Helping to give that low to the ground look is the addition of clip-on bars that have been installed halfway between the triple clamps. Affixed with new grips, minimalist black levers, a new master cylinder and switch-blocks it’s an ultra clean look for a very functional machine. 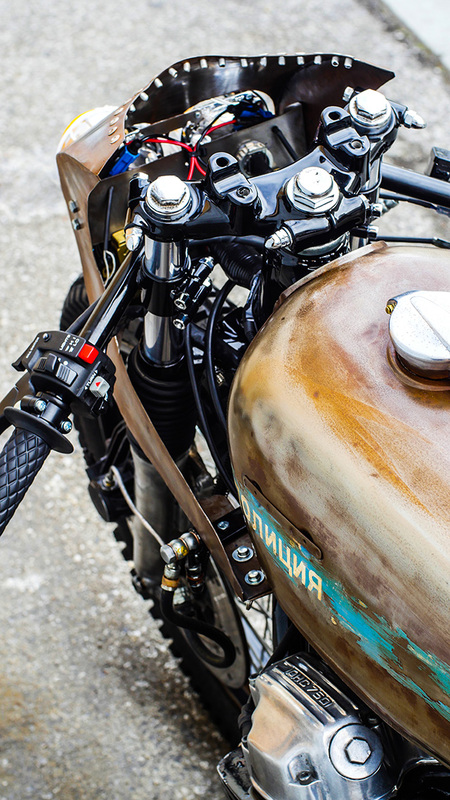 With a strong relationship with Dime City Cycles, Kyle sourced all the extra parts through them including the LED taillight strip that keeps this Russian street legal. The standard Honda brakes call a halt to forward momentum but the front line has been cleverly re-routed before bringing the stopping power to the now drilled rotor. Rolling stock can be a make or break design decision on any build but Thirteen and Company have got it exactly right; laced up black rims wear Shinko dual sport rubber for the ultimate urban warrior look, 3.75-19 front and 4.00-18 in the rear. One very clever touch to the build is the hand stitched leather bag that hangs from the seat rail. Not only is it a brilliant counter balance to the oil tank on the other side it helps hide some of the electronics and adds some rider storage. It’s these little touches that Kyle does with his own hands that make all his bikes both unique in their styling and precision perfect in their finish. For a young builder it’s a big challenge to take on a build in a style they’ve never attempted before, but Kyle has hit it out of the park and The Russian helps set his company up for a big future we can all toast to. Na Zdorovie!